Poland is the 9th largest country by area size in Europe and on top of that has also been in the middle of historic changes and events. Once the Kingdom of Poland, later a significant force in the European history as the Polish-Lithuanian Commonwealth, affected both by Prussian and Swedish invasions and later suffering due to the World Wars, Polish history has its glorious and painful times. The country’s castles are some of the most impressive in all of Europe and serve to tell the historic tales to this day. 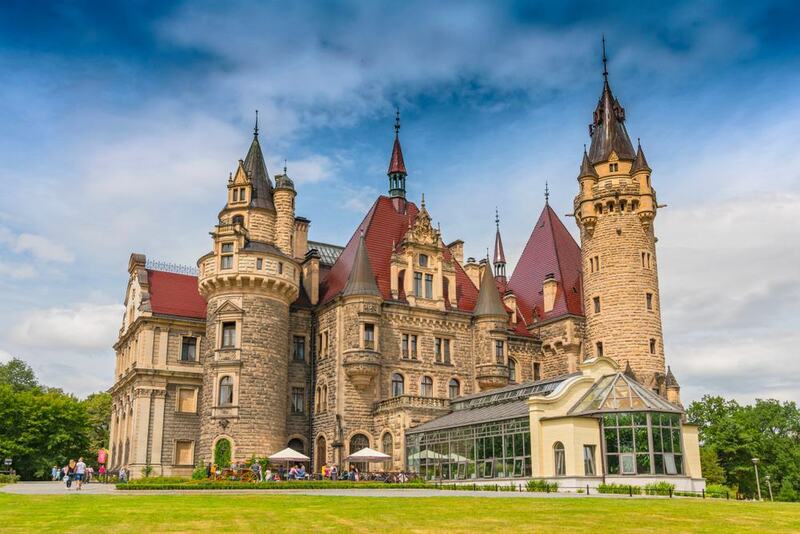 From famous Teutonic Order brick castles to medieval strongholds and fairytale-worthy structures, Polish castles deserve the attention from anyone visiting the country. Malbork Castle in Northern Poland is one of the most significant and well-known castles in the whole country and all Eastern Europe for that matter. Located on the shores of River Nogat, Malbork Castle was built in the 13th century by the Teutonic Knights. In the 15th and 18th centuries, the castle was one of the several royal residences in the Polish-Lithuanian Commonwealth. The style of the castle is a classic representation of medieval architecture and Malbork Castle is a traditional medieval fortress. Malbork Castle is also considered one of the largest brick castles in the world. Just like many other medieval castles, Malbork held a strategic and rather favorable position. The castle’s convenient location on the shores of River Nogat meant that it controlled the river passage and was able to collect tolls from trading ships and barges. Malbork Castle was restored shortly before World War II but then destroyed again in battle. It remained largely neglected until its final restoration in 2016. Baranów Sandomierski Castle is located in the southeast of Poland and it is one of the finest examples of Mannerist architecture in the country. The 16th-century castle, also known as the “little Wawel”, took approximately 15 years to build. It is believed that the original architect of the castle was Santi Gucci from Italy. The ownership of the castle changed several times through the years and it was a residence for several noble families. After World War II the castle had suffered damages but was restored shortly after. The three-storey castle has a rectangular layout with four round bastions in each corner. Baranów Sandomierski Castle is one of the best-preserved Renaissance castles in Poland. Książ is the largest castle in southwestern Poland in the Silesia region. Located in an awe-inspiringly picturesque location, Książ sits atop a hill enclosed by a vast forest. The current castle dates back to the late 13th century. In the late 14th century the ownership of the castle briefly passed on to Bohemian rulers. During World War II, the castle was seized by the Nazi regime and the castle was intended to become headquarters for Adolf Hitler. A lot of the castle interiors were destroyed during the Soviet rule and many artefacts stolen. Nowadays the castle features predominantly baroque and neo-renaissance architectural elements and its medieval origins are difficult to spot. The main castle tower is the most dominant medieval element in the whole complex. 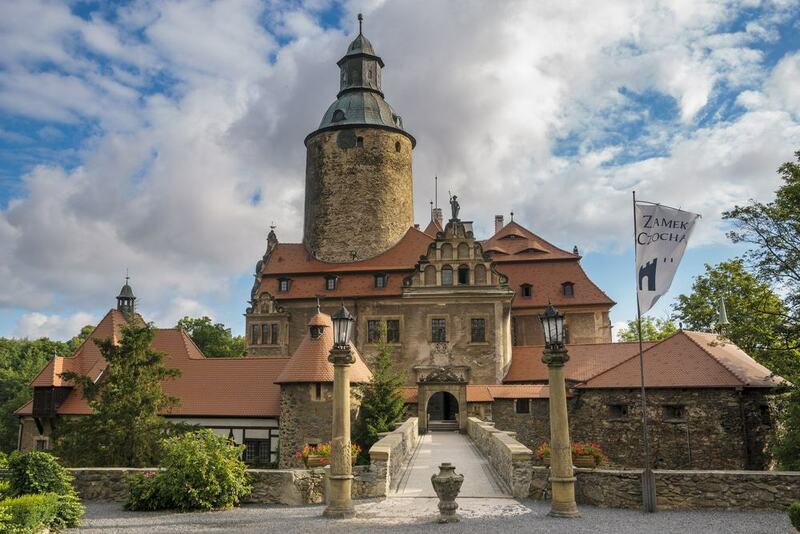 Czocha Castle in southwestern Poland is a beautiful defensive castle dating back to the 13th and 14th centuries. The current building, however, dates back to the very early 20th century, when the castle was rebuilt based on the 18th-century painting of it. While the original castle was built in the medieval times, the whole castle complex burned down in 1793. Nowadays the castle has been partially turned into a hotel and visitors can experience the charm and the unique experience of staying in a castle overnight. Some of the castle chambers have been decorated in a historic manner for sightseeing. 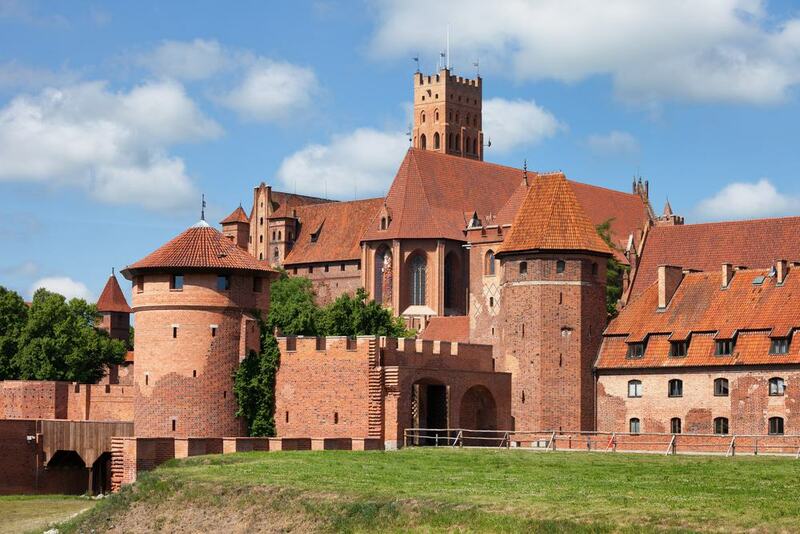 We already mentioned the famous Malbork Teutonic Knights’ Castle, and Kwidzyn Castle in the north of the country is yet another excellent example of Teutonic architecture in Poland. One of the most recognisable and noteworthy features of the castle is the so-called Dansker – a large sanitary tower. These types of towers, even though found in other castles too were a dominant feature in Teutonic structures. This particular tower is connected to the main part of the castle by a five-arcade passage. The castle was originally built in the 13th century but during the 17th century the castle was partially destroyed and heavily damaged by Swedes. It wasn’t long until it stood again in its former glory as restoration took place relatively shortly after – in the mid 19th century. 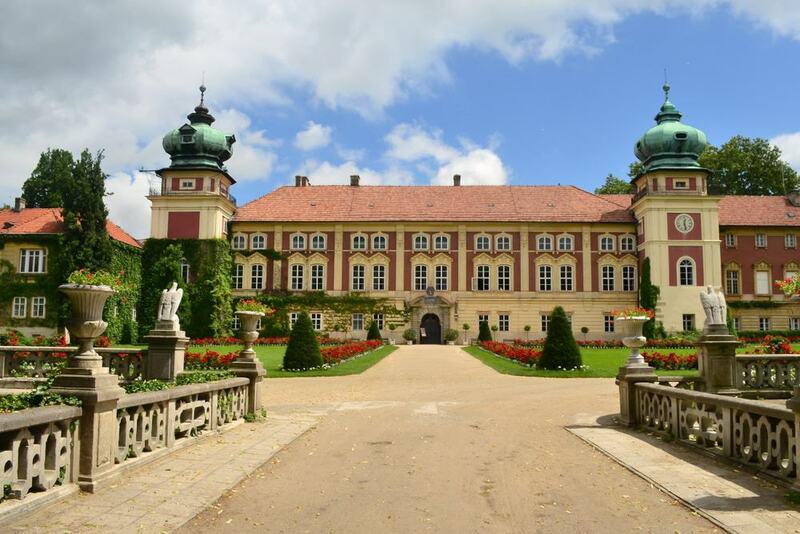 An indeed a regal residence and truly one of the most beautiful castles in the whole of Poland is the Łańcut Castle, also one of the country’s national historic monuments since 2005. The building of the castle was started in the 16th century but during the 1600s it was upgraded and turned into a palatial building. Its splendid appearance and function was due to the fact that it was owned by the most powerful families in Poland – first the Lubomirski family and later on the Potocki family. The castle features several architectural elements and features, like, classical, rococo, and neo-gothic. As expected with such an aristocratic gem, the palace is surrounded by English-style park complete with pavilions and farm buildings. One of the most striking features about this particular palaces is its interiors. Some of the best-preserved rooms date back to the 17th century, however, none are fully-preserved from their original form. Despite that, they are of immaculate historic accuracy and thus are some of the most impressive palatial interiors in all of Poland. The Great Vestibule, Zodiac Room, and the Room under the Wooden Ceiling are the oldest in Łańcut Castle. The Royal Castle in Warsaw is one of the most well-known castles in Poland. Not only because it is located in the Polish capital, but also due to its historical significance. For centuries it was the castle residence for Polish monarchs until the Partitions of Poland in the late 18th century. 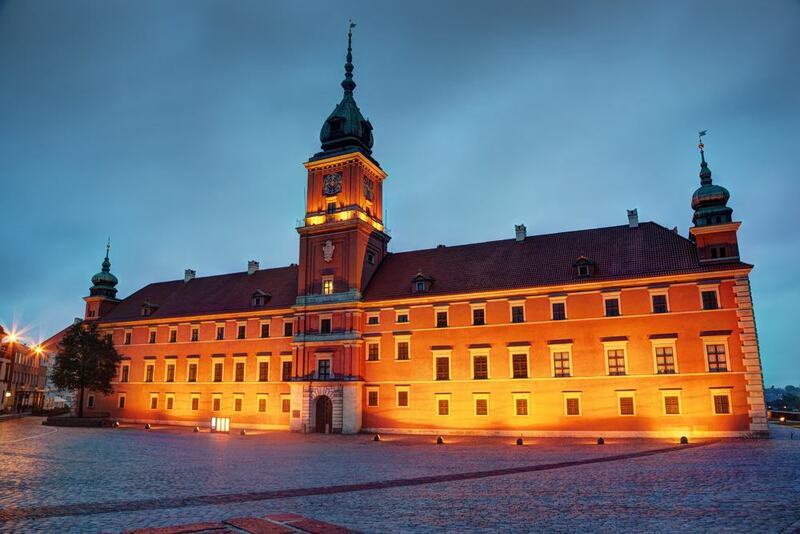 Located in the central Castle Square, The Royal Castle in Warsaw has had a turbulent past. The oldest part of the castle can be traced back to the mid-14th century, when the Castle Tower was built. Only the parts up to the first floor have remained from the original structure as the facade was destroyed by the German army during World War II. Further extensions to the castle were added in the 16th century and one of Europe’s most prominent Renaissance architects, Giovanni Battista di Quadro, worked on the alterations. The Curia Maior (Big Manor) part of the castle, which had already been built in the 1400s, was altered to be fit for Parliament meetings that would take place there. During the period of alterations, a new building – the Royal House – was built next to the Curia Maior and during the parliamentary sessions the King would be residing in the newly built Royal House. Further building work and extension of the castle took place in the Late Baroque period. Like many other buildings in Poland, the Royal Castle also suffered significant damages during World War II. First, it was shelled by German artillery in 1939. In the same year an ordered was issued to blow the castle up. Before it was done, parts of the castle were demounted and taken to Germany and Krakow, and Polish art historians, against warnings of being arrested or shot, also made attempts to salvage parts of the interiors that were later used in the restoration of the castle. The interiors were completely stripped down and the walls were blown up 1944. Immediately after the end of World War II, a plan to reconstruct the castle was made and the Royal Castle would be rebuilt as a symbol and monument of the Polish history and culture. 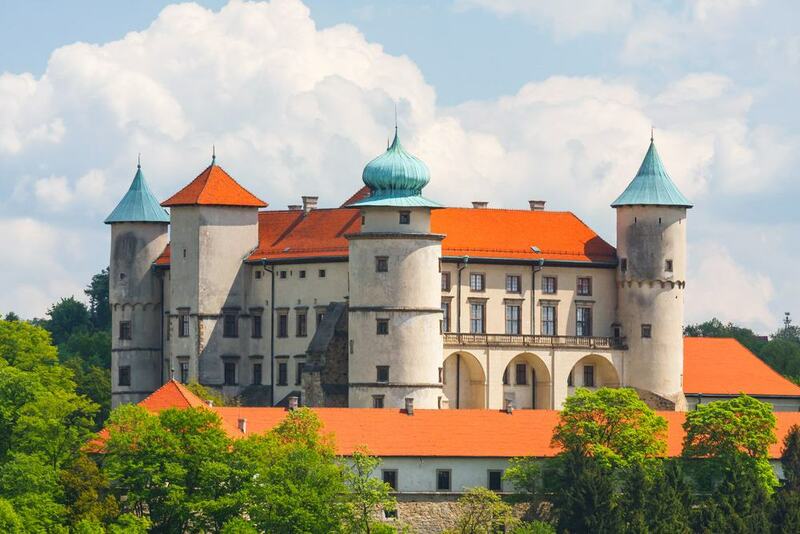 Nowy Wiśnicz Castle in southern Poland was built in the 14th century as a stronghold for the Kmita family. The protective bastion was built in a rectangular shape with an inner courtyard and four towers on each corner. The main architectural elements featured in the castle design are late Medieval, early Renaissance and Baroque. The arched inner courtyard is one of the most prominent features representative of that time period. A similar inner courtyard is also featured in the Wawel Castle. In the 16th century, the ownership of the castle passed on to the prominent Lubomirski family. Soon after buying the castle, the Lubomirskis drew up plans to alter the castle with Baroque features. It wasn’t long, however, when the Swedes destroyed the castle during the Deluge. When the Polish-Lithuanian Commonwealth defeated the Swedes, restoration of the castle was carried out but never fully completed. 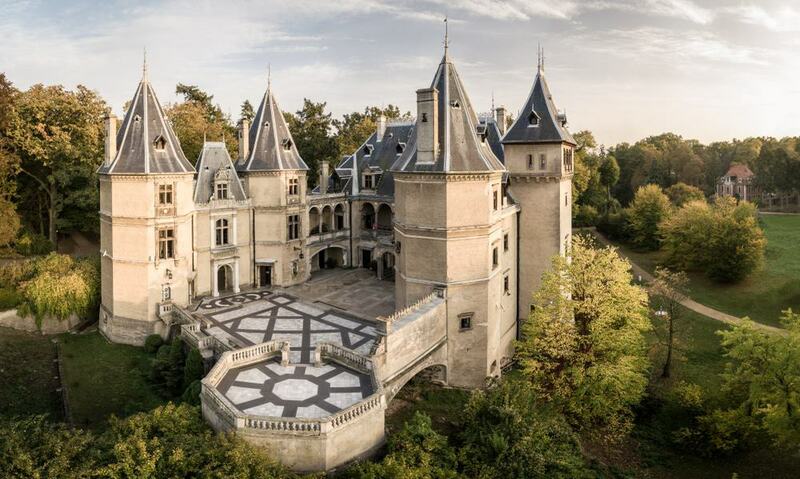 At the end of the 18th century the castle started falling into decline and was completely destroyed by fire in 1831 and left abandoned until the early 20th century when it was purchased by Professor Maurycy Straszewski of the Lubomirski Ancestral Federation. He attempted restoration but, again, the process wasn’t finished due to the outbreak of World War II. The castle was finally fully renovated after the end of the war. Quaint and rather magical in its appearance, Gołuchów Castle in west-central Poland was first built as a defensive structure, however, due to its early Renaissance architectural style, to the modern eye it seems like nothing short of mesmerising. Built in the mid-16th century, Gołuchów Castle was a defensive residence of Rafał Leszczyński, the Voivode of the Brześć Kujawski Voivodeship. When the castle was reconstructed in the 19th century, the alterations were made in the French Renaissance style. The charming castle towers rise from the forested scenery and are one of the most prominent features in the building. Noteworthy is also the inner courtyard of the castle with the typical Renaissance arches. Nowadays the castle is open to visitors as a museum. Kórnik Castle in western Poland was first built in the 14th century. However, the structure that we see today has undergone several modifications through the centuries and the current Gothic Revival design was done in 1855 by the architect Karl Friedrich Schinkel. Overall the castle certainly stands out in the overall castle landscape in Poland, and on top of that it was one of the few castles to survive World War II. Access to the castle is via a wooden drawbridge, and visitors can appreciate the castle not only from the outside, but also from the inside. The interiors are well-preserved and one of the most spectacular rooms in the whole castle is The Moorish Hall which, as the name implies, has been designed to resemble Moorish architecture famous in North Africa and Spain. 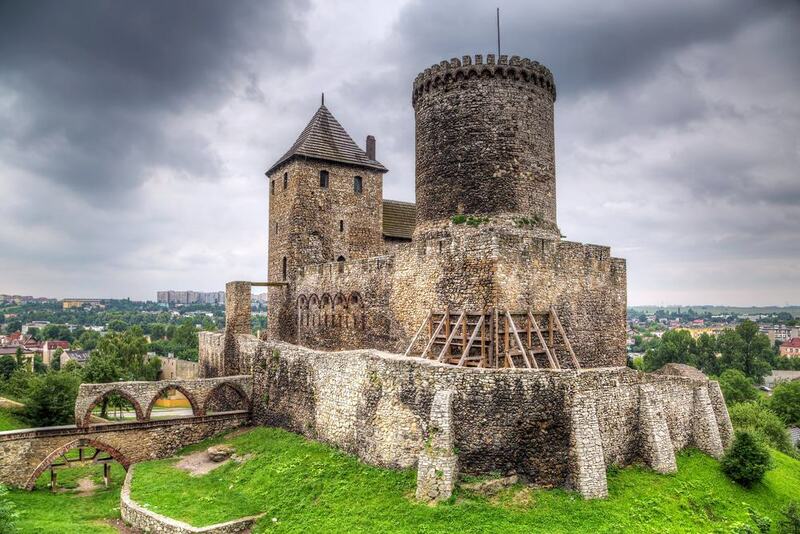 Truly medieval in its design, Będzin Castle in southern Poland is a stone castle that dates back to the 14th century, however, it is known that a previous wooden structure preceded the castle as far back as to the 11th century. The fortified stronghold had a significant role in protecting the Kingdom of Poland and later the Polish-Lithuanian Commonwealth. Since the town of Będzin has been known in records from the 9th century, it comes as no surprise that a wooden fortification was built to protect it. During the reign of Casimir III the Great, the wooden fortress was gradually rebuilt in stone. The castle remained intact until the late 16th century when it started falling into despair. Soon after, in the early 17th century a fire caused more damage and the following Deluge pushed the castle in nearly complete destruction. While attempts to repair it were made over the following decades, the stronghold never fully regained its former glory. Located in the historic centre of Kraków as well as being a UNESCO World Heritage Site since 1978, Wawel Castle is one of the most famous Polish castles. It is also one of the largest castles in the country and it incorporates various architectural styles prominent in Europe over the centuries – medieval, Renaissance, and Baroque. The castle has mostly served as a residence through the centuries for Polish royalty both in the Kingdom of Poland as well as the Polish-Lithuanian Commonwealth. That was the main reason why the castle often got refurbished and upgraded with improved design features, sculptures, and art pieces. Just like many Polish castles, Wawel Castle also suffered during the Swedish invasions and later on the castle was invaded by Prussian armies. Nevertheless, because of its significance, it was never left neglected and the damages were repaired to keep Wawel Castle as a symbol for the prevalence of the Polish state. Without a doubt, Moszna Castle is not only one of the most recognisable Polish castles but also one of the most beautiful castles in Europe. The historic castle is located in the southwest of the country and the current building dates back to the 17th century. The castle’s appearance wouldn’t leave anyone indifferent as the quaint architectural details present in the exterior are intricate and awe-inspiring. Baroque, neo-Gothic and neo-Renaissance architectural styles can be seen in the castle design. One of the most noteworthy aspects of Moszna Castle is that it has exactly 99 turrets and 365 rooms. Niedzica Castle in south Poland is a medieval castle dating back to the 14th century. 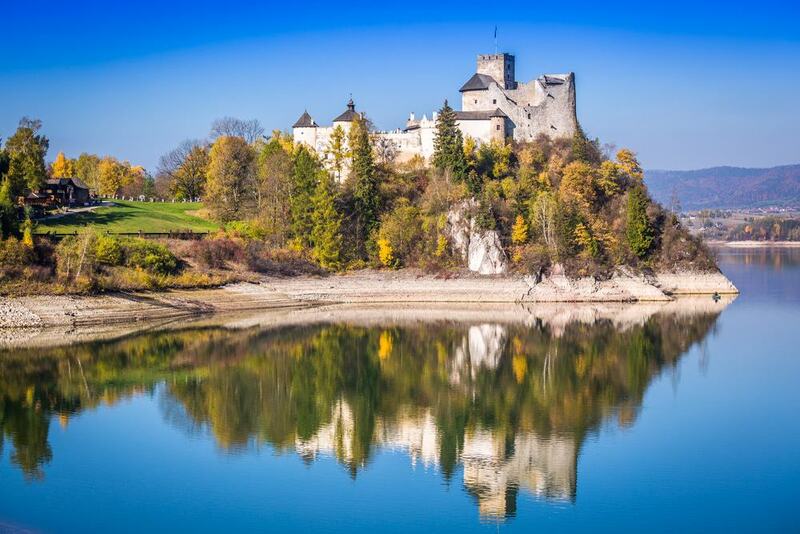 The castle is perched on a hill 566 meters above the sea level, just a few hundred meters from the Dunajec River mouth. 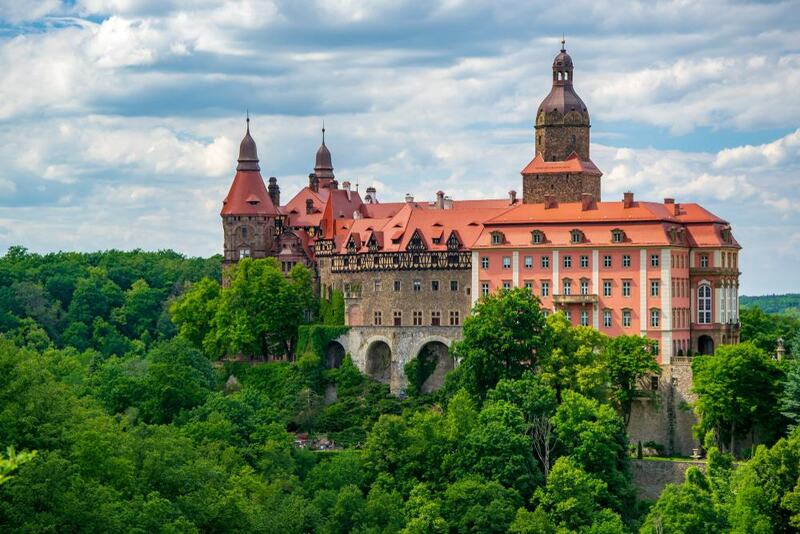 Because of its picturesque location, Niedzica Castle is a favorite in Poland and has been pictured on many national publications and books. Due to its southern location, it has always played a part in the Polish-Hungarian relations. The castle was originally built by a Hungarian known as Kokos from Brezovica and Hungarian owners lived in the castle until World War II when the last inhabitants abandoned it before the invasion of the Red Army. After the war the castle was repaired by the Polish Ministry of Culture and since then it has become one of the most visited places in this part of the country. 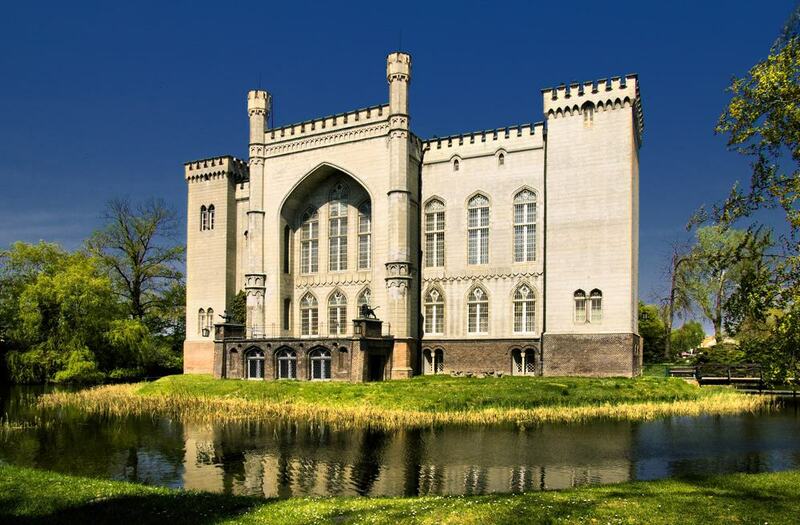 Lidzbark Warmiński Castle is also commonly referred to as the Castle of Warmian Bishops. The beautiful castle dates back to the 14th century and is one of the main Gothic architecture attractions in Poland. 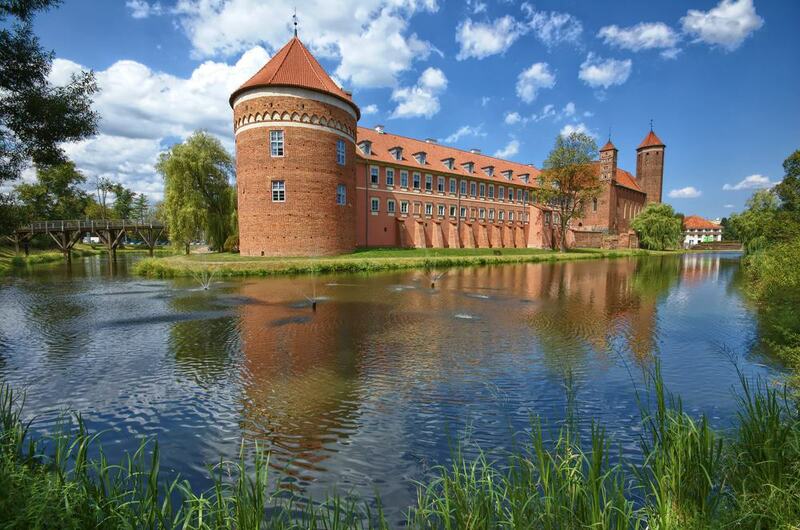 The castle is located in northern Poland, not far from the border with Kaliningrad. The castle has a square plan and each wall is 48.5 meters long. Within the courtyard there are two levels, both of which feature cloisters – the only in all of Poland that has not been altered over the centuries. Serving as a seat to Warmian bishops in the years after being built, later the castle passed on to the Teutonic Order.